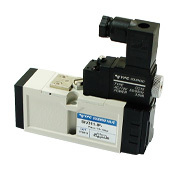 SIV series valves are designed for mounting on valve plates. Due to the fact that our valves are manufactured according to appropriate European ISO standards, you can be certain that the valve will fit your plate regardless of its manufacturer. SIV valves are also characterized by high throughput, so they can be used with devices requiring large amounts of compressed air. Valves conforms to one of the following standards ISO 15407-1 / VDMA 24563, ISO 5599-1:2001, ISO-2. Flow from 700 l/min up to 3500 l/min (with pressure 5 bar, depending on valve size). Working pressure: from -10°C to 60°C.